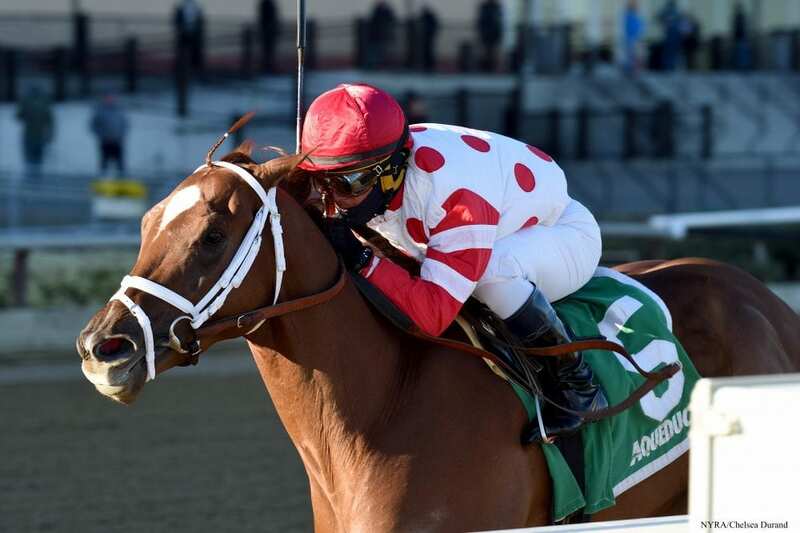 Red Oak Stable homebred Bal Harbour will turn back in distance from a solid third-place effort in the Queens County when he takes on a talented field of five in Saturday's featured Grade 3, $100,000 Toboggan for 4-year-olds and up at Aqueduct Racetrack. Trained by Todd Pletcher, the 4-year-old son of First Samurai won the Sapling and Smooth Air as a juvenile but failed to fire his best shot through the first three starts of his 2018 campaign. Following a seven-month freshening that included the gelding of the talented chestnut, Bal Harbour returned to nose out a victory in an optional claiming tilt at Keeneland on October 21 before wiring a compact field in the off-the-turf Gio Ponti on November 23 at Aqueduct. Last time out, when traveling 1 1/8-miles here in the Queens County, Bal Harbour set a contested pace and stayed on strong to finish third, just two lengths back of the victorious Name Changer on December 10. Bal Harbour will travel just seven furlongs as he looks for his first graded win in Saturday's Toboggan. Pletcher said he is hopeful that turning back in distance will benefit Bal Harbour. Junior Alvarado will pilot Bal Harbour from post 4. It could be tough sledding on the front end for Bal Harbour in the Toboggan, facing a field of multiple stakes winners capable of quick opening fractions, including the graded stakes winner Solid Wager, New York-bred multiple stakes winner Gold for the King, speedy graded stakes placed shipper Colonel Sharp and Aqueduct main-track specialist Skyler's Scramjet. Trained by Michelle Nevin, Skyler's Scramjet has won four of seven starts on the Aqueduct main track including a victory in the Grade 3 Tom Fool last season. Last year, the 5-year-old Creative Cause grey also ran a creditable fourth in the Grade 1 Carter at Aqueduct before narrowly missing in the Runhappy at Belmont Park when second, by less than a length, to Westwood. Freshened following an uncharacteristic sixth as the beaten favorite in the June 17 Mr. Prospector at Monmouth, Skyler's Scramjet returned to the Big A on December 23 with a strong second, defeated a head by Recruiting Ready, in the Gravesend which earned a 100 Beyer Speed Figure. Dylan Davis retains the mount from post 2. Francis Paolangeli's Gold for the King, by Posse, enjoyed a solid 2018 campaign, posting a record of 2-2-1 from seven starts, including a romping 9 ¼-length win in the Thunder Rumble division of the New York Stallion Series Stakes. The Charlton Baker trainee finished third in the Gravesend, defeated just two lengths, and slides into the Toboggan from a difficult third in Saturday's Say Florida Sandy when full of run, but lacking racing room. Manny Franco will take over aboard Gold for the King from the inside post. Gary Barber's Solid Wager, previously trained by Peter Miller and now in the care of Chris Englehart, will make his 49th career start when he bursts from post 5 under Jose Lezcano on Saturday. The now 8-year-old Birdonthewire gelding boasts a career record of 10-8-6, while racing almost exclusively in California, including a victory in the 2016 edition of the Grade 3 Midnight Lute at Santa Anita. The California-bred Solid Wager enjoyed a productive 2018 with two wins and four seconds from seven starts, highlighted by a 6 ¼-length victory in the Cary Grant at Del Mar. Rising Sun Racing Stables' Colonel Sharp arrives at the Toboggan from a spectacular performance at Laurel Park to win the Dave's Friend by a head after setting a torrid, contested pace. The 6-year-old Colonel John gelding earned a career-best 100 Beyer number for the winning effort. Colonel Sharp, trained by Hugh McMahon, posted a record of 5-2-2 from 12 starts in 2018, which also included a win on September 1 in the Maryland Coalition at Timonium. The ultra-consistent bay will leave from post 3 under J.D. Acosta. The Toboggan is slated as Race 5 on Saturday's 9-race card at Aqueduct. First post time is 12:25 p.m. This entry was posted in Racing and tagged aqueduct, bal harbour, Junior Alvarado, Toboggan Stakes, todd pletcher by Keith McCalmont/NYRA. Bookmark the permalink.